Hello! 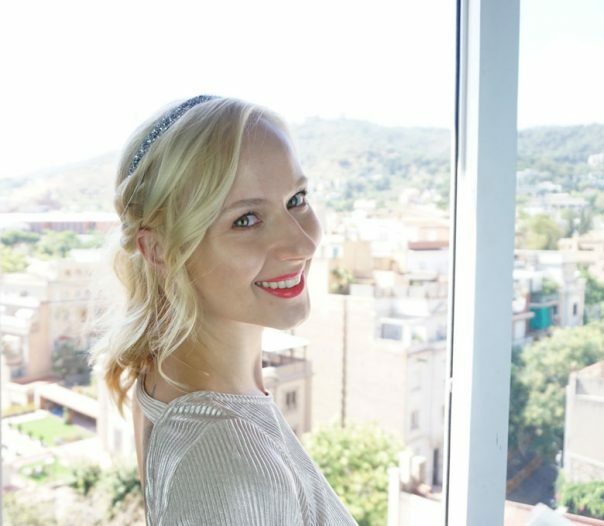 Ania from Hairs Affairs here and this month I’m back with an easy DIY hairstyle idea that would be perfect for homecoming or any other semi formal event. A ponytail may sound boring but the truth is it has endless possibilities to be dressed up or down. For this special occasion we’re going to be dressing it up of course, by embellishing it with a pretty head band and a braid. This style looks the most flattering, effortless and romantic if some face framing layers are left out. Most of us will need to prep our hair in some way to achieve a loose wave, by either using a big curling wand, a flat iron, or your favorite heatless technique. This will make the hairstyle look polished but not like you’re trying too hard. This is the head band I’m using in this tutorial. You can basically find different kinds of these everywhere at different price ranges. I prefer this style because the metal or plastic ones tend to pinch behind the ears and I get a headache throughout the day. These however sit comfortably around the head and the rubber at the bottom is very easy to hide. Part off some hair at the bottom and secure it with a clip or a hair tie. You’ll later use this hair to cover the bottom of the head band. Roughly part a section from the top of your head to right behind your ears on both sides and place the head band on your head pulling the rest of your hair through it. Release the bottom section and pull everything except for the sides into a ponytail right below the occipital bone. Pull and tug on some hair in the crown area to loosen it up and create some volume in the crown. If you need to, you can tease your hair at the crown first, before pulling it into a ponytail. On one side, leaving out some face framing layers, braid the rest of the hair into a normal 3 strand braid and pull it apart for volume. Place the braid to the back of your head over your pony and wrap it around the base of the pony and pin in place with a bobby pin. Twist the section on the other side, loosen up the twist and also pin it in place around the base of your ponytail. The last step is to take a small section of your pony and wrap it around the base and pin it in place with a bobby pin. This will cover the hair tie. TIP: You can opt in for a bun instead of the ponytail, which will give the hairstyle a more formal look. You can visit my blog Hairs Affairs for some ideas on different kinds of buns for different hair lengths. 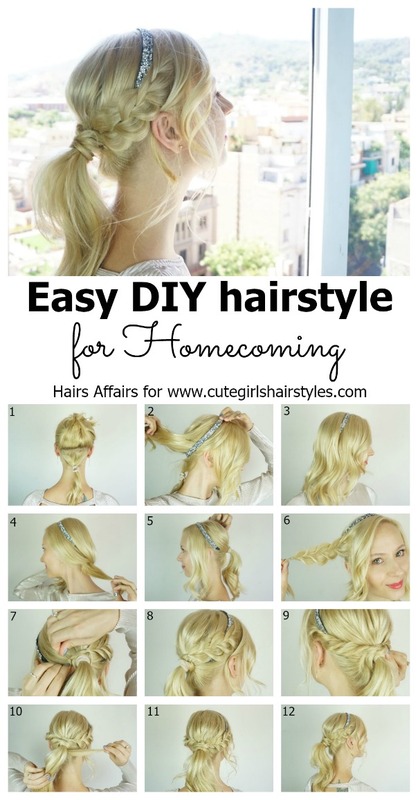 What do you think of this homecoming hairstyle idea? Would you give it a try? I wish you all nothing but wonderful hair days!